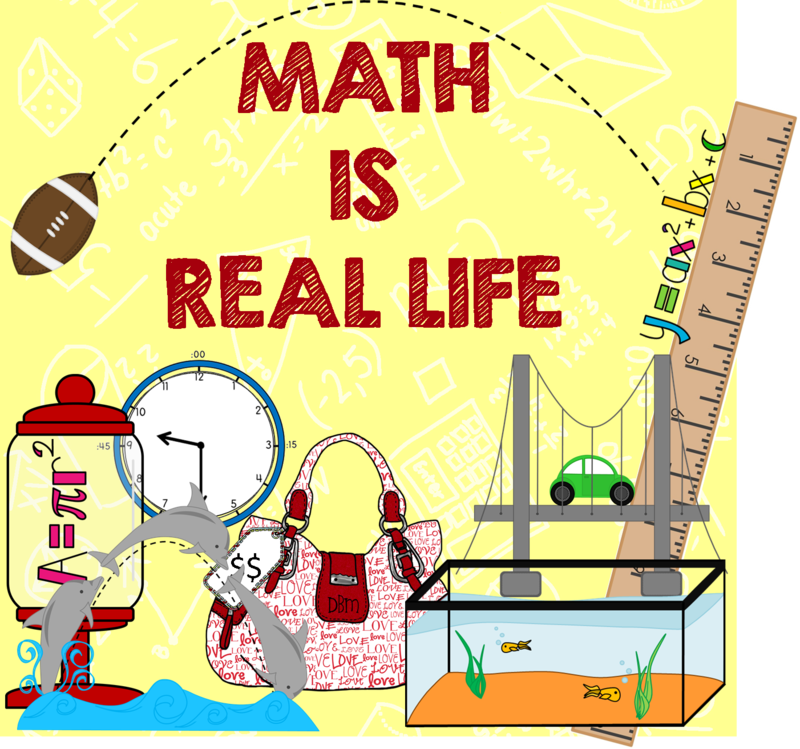 Math IS Real Life – August 2014 Edition – it’s been a whole year! You may or may not recognize some faces in these pictures…. Bottom right me dressed up as my MissMathDork avatar 🙂 and Jennifer from 4mulaFun. Top right Donna from Math Coach’s Corner. Bottom right Elizabeth from Hodges Herald. It was soooooo fun to meet and hang out with each of these ladies! I met Danielle from Live.Love.Math too, but I think she has that photo! Once I got back from Dalles/Fort Worth on Thursday, I left again Friday night for “College Girl” weekend. This is when my 3 college roomies and I all flock to one central location for a weekend each summer. I was exhausted from CAMT, but was soooo excited to see my girls. By now, you are probably asking yourself…. when is she getting to the math part?! While I could get into the cost of traveling, or the altitude of my plane, or the time / mileage spent, I’m going to opt to talk about TOLL BOOTHS and lack of cash! When I headed to Texas, I made sure to take some cash with me… not a ton, $80 to be exact. I spent it on a midnight donut, an awesome math tee-shirt (that should be arriving any day now! ), and on airport tolls ($4.80 going towards Dulless Airport in the non-rush hours). I ended up having $5 left to my name when I came home. I didn’t really think much about it until I was driving to “College Girl” weekend. As I hit the last leg of my road trip to see my girls, I hit a toll road. “No problem” I thought to myself, and I reached for my credit card. As I approached and looked at the lanes I had a sudden pit in my stomach. Okay…. so…. EZPass – nope, don’t have it. Cash… yikes?! I just don’t carry it…. oh wait! I have the $5 left over from CAMT. At this point the pit in my stomach goes away and I pull into the Full Service lane. I hand the lady $5, she sneers at me a bit because the toll is $0.70 (yes… not 75 cents which is an EASY amount of exact change to have….) and hands me my $4.30 in changes. I drive along my way and don’t think anything more of it. Actually, I was a bit relieved because driving to Dulless airport the toll was MUCH more expensive at $4.80. My $5.00 would have covered that…but still, I’m feeling relieved. Well… I was feeling relieved. About 5 miles down the road, I hit ANOTHER toll booth. Again 3 options…. As I had $4.30, I wasn’t able to jump into the “exact” lane so I went to the full service lane again, and this time paid $0.75. Now I have $0.30 + $3.25. I’m pretty sure I’m home free with tolls as my GPS says I’m 4 miles away from my friend’s house…. but no, there is ANOTHER toll as I take her exit ramp. My $0.55 in change still won’t allow me to go through the “exact” lane, so again, I go full service and pay my $0.70. Now I have $0.55 + $2.30. E-gads…. I spent $2.15 in tolls on the way there. Okay, not nearly as bad as going to the airport…. but I know to hold onto my cash for the trip back. On the way back home, another friend called and asked that I meet her downtown in Richmond. No problem! I’m already here, I might as well make the most out of the 4 hour commute! So I go through the tolls backwards. I’m able to pay for one of the tolls with “exact” change and end up with $0.70 left. To get to my location in down town Richmond, I needed to take 3 more tolls…. Categories: #mirl, computation and estimation, math is real life, mental math, and number and number sense. I hope that your visit with friends was fabulous! I also need to get an EZ Pass now that they charge for some of the tunnels in my area. I had a similar experience to yours when I drove from Massachusetts to D.C. 7 or so years ago. I was not prepared for the amount of tolls that I encountered. I arrived in D.C. with whopping 50 cents! I couldn’t get to the ATM at Union Station fast enough! Thanks for inviting me to link-up! I had a blast!! And….. tolls when you are not prepared is SOOOOO STRESSFUL!!! Sorry you had to deal with this too! Sounds like you had a fun month! Tolls are not a part of my daily life at all so when I travel somewhere else, they always make me anxious. I tend to have spare change rattling around in my cup holder unless I have recently cleaned out my car. I remember once when I was heading to Boston I had to go to an ATM because I didn’t have any cash for a toll. The toll ended up only being about 75 cents which makes going to an ATM to pay it crazy. Especially since I had to drive a few miles off the interstate exit just to find one. Tolls aren’t a part of mine either! I need an EZPass for when I need to go closer to DC though…. And, I had actually just cleaned the car! We had it detailed the week before as we are thinking about trading it in – NO CHANGE to be found!! This post made me giggle Jamie! I could feel your stress as I was reading! Thanks for letting me link up all year! I am sooooo ridiculous about bring prepared for things!! I was TRULY sweating over this whole situation!! Ugh…I do not miss the toll roads on the WV turnpike or the PA turnpike since I moved to SC. Thank goodness you had enough cash. I could share a story with you about being stuck in Beckly WV without cash or gas during a storm that took out all of the power for several days. Stressfull! ER MER GERD!!!! We have the same t-shirt! Most of the places that are games are used – rural North Dakota and downtown Los Angeles, for example – the students have no experience with toll booth so just the idea of it would be interesting to them. I know that sounds funny if you are on the east coast, but I think it will be true.